Getting Around DC – Toastmasters 2016 International Convention – Washington D.C.
- What does “DC” Mean? There are approximately 6,500 licensed taxicabs in D.C. Despite the increasing popularity of rideshare services such as Uber and Lyft, use of taxis in D.C. has actually increased in recent years. Unlike rideshare services, taxis are able to be hailed from the street and they have the ability to provide wheelchair-accessible transportation. Roof lights on all D.C. cabs have LED text that explicitly state whether or not the cab is available for hire. Most are red with a gray stripe on the side. Get the DC taxi app and access all taxi companies. The largest taxi operators are Yellow Cab (202 544-1212 or +1 202 TAXICAB) in D.C., Barwood (301 984-1900) in Montgomery County and Silver Cab (301 277-6000) in Prince George’s County, in Maryland. In Virginia, Red Top (703 522-3333) is the largest operator in both Arlington County and Alexandria. Taxi rates for all D.C.-area taxicabs are fixed by the jurisdiction in which they are based and the rate does not change when state lines are crossed. Rates for DC-based taxicabs are fixed by the DC Taxicab Commission, currently $3.50 for the first eighth of a mile and 27¢ for each additional eighth of a mile. There is a $1.00 surcharge for additional passengers, regardless of the number of people. There is no rush hour fee, although meters do charge 42¢ for each minute the car is stopped in traffic or traveling under 10 mph. Ridesharing means riding together in one car or van. Sharing the ride saves money on fuel, insurance, and car maintenance. Ridesharing can also reduce time spent on the road, because vehicles with enough passengers can use High Occupancy Vehicle (HOV) lanes and 495 Express Lanes. When they’re not behind the wheel, passengers can read, nap, or chat, reducing stress. Ridesharing also helps reduce air pollution, greenhouse gas emissions and traffic congestion. Uber and Lyft are not technically taxi cabs and cannot be hailed from the street. You must use their respective apps and as such, it is important to open and setup your accounts with payment information before your trip. Some people find such ridesharing services useful because it requires no point of service payment, you don’t have to calculate the tip (or maybe you do due to the recent settlement between Uber and its independent contractors), and you don’t have to request a receipt. The apps are designed to handle those things for you and in some cases, may even connect to online travel expense report services like Concur. Car sharing is an alternative to the traditional rental car, where–if you have an account—you may rent a vehicle anywhere within your area for a few hours to a few days. Options include ZipCar, Car2Go, and Enterprise CarShare. These cars are parked on the street and when you book them with the app, you can open the door and drive away! 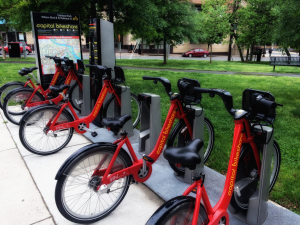 Capital Bikeshare, operates a bike sharing network that has over 3,000 bicycles available at over 350 bike stations throughout the Washington, D.C. area. Users can register with a credit card, and take a bike from any station and return it to a different station. Membership fees are $7/day or $15 for 3 days. 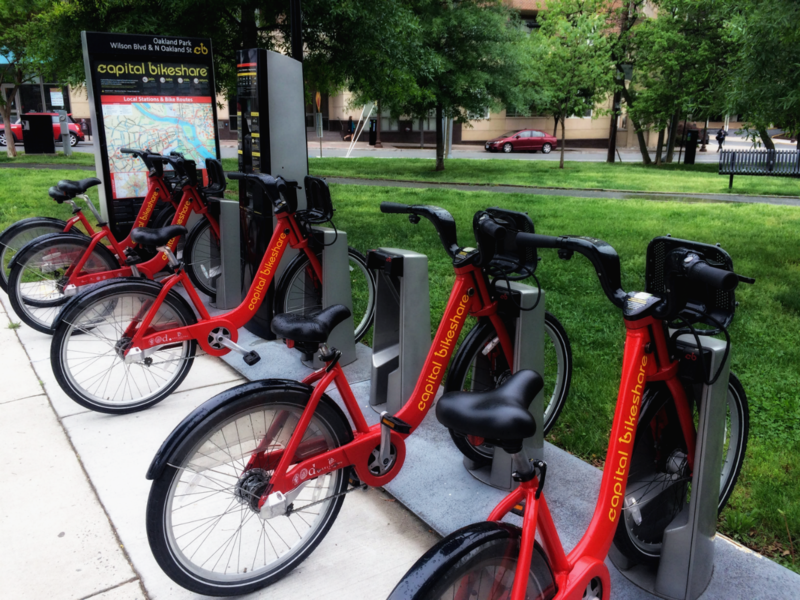 You can use a credit card at the automated kiosks attached to every Capital Bikeshare station. On top of membership fees, usage fees vary, but the first 30 minutes are free. This is intentional to encourage people to use the system for short place-to-place trips; however, after riding for 30 minutes, you can dock your bike into a station, wait a couple of minutes, and then take the bike out again to restart the timer.